The Makers of Schmutzerland Create Cherry Blossom Jewelry & Packaging for the U.S. Capitol Visitors Center. 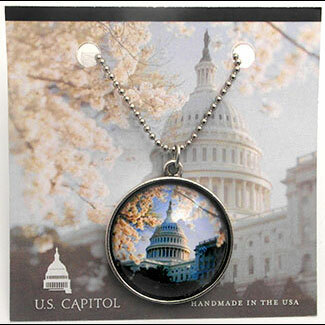 Nutley, NJ,March 19, 2015 –The U.S. Capitol Visitors Center, asked the makers of Schmutzerland to come up with a custom design, featuring an artful image depicting the majestic dome of the U.S. Capitol framed by cherry blossoms. In addition to designing the jewelry, Schmutzerland’s designers also created the special packaging, that enhances the jewelry, as well as making the pieces collectable keepsakes of a visit to one of the nation’s most iconic buildings. Meeting the challenges presented by the federal governments requirements, that all components be domestically sourced, Schmutzerland had the glass cabochons hand made by the artisanal glassmakers at 413 Glassworks in Chesire, MA. The settings were made by Becky Nunn Design in Port Townsend, WA. “It was quite an under taking managing this project”, said David Rubin, the company’s manager of operations and marketing. “Coordinating the artisans, to meet the specs of this project, required precise communication to fit the designs we created. It took patience and painstaking accuracy, but we got the U.S. Capitol Visitors Center the look and feel they wanted. By having the ability to design the packaging in house, the company, which also designs and makes the Fauxhemian, SmashCaps and Charm Farm lines, makes custom packaging a more cost effective operation. “By not having to go to outside design firms for services, we pass the savings on to our clients” says Bonnie Berish, the company’s art director. 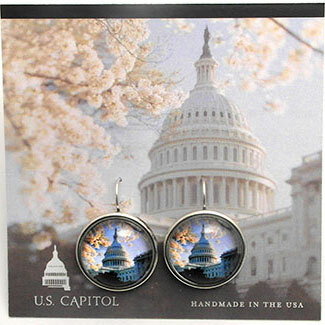 The U.S. Capitol line consists of a large necklace, a small necklace, earrings and cuff links. All of the pieces are sterling silver plated cast settings, with handmade glass cabochons, which have a classic design and substantial feel. Schmutzerland’s designers have the ability to customize labeling to feature the retailer or organization on the packaging or create a totally original packaging solution that is made exclusively for the client. By using custom packaging, retailers can enhance brand awareness in their stores.